If your business requires the moving, storing, and pouring of drums, the proper equipment can make a huge difference in your bottom line. 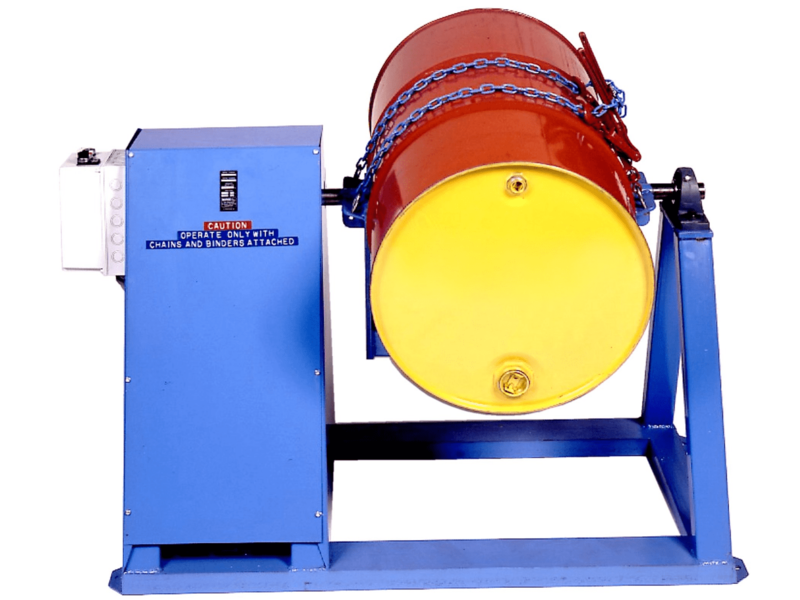 Using the right drum handling equipment will also improve workflow and worker safety. Consider the benefits and features of the different types of industrial material handling equipment to find the right items for your needs. Safer workplace. Full drums are heavy and are often filled with hazardous liquids. Moving them can be difficult for a worker or multiple workers to move manually, and attempting to do so can lead to injuries, accidents, and spills. 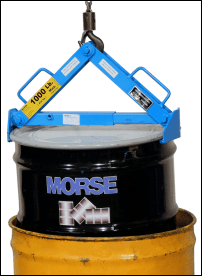 Using the proper drum handling equipment makes the work easier, which protects employees and creates a safe workspace. Greater efficiency. 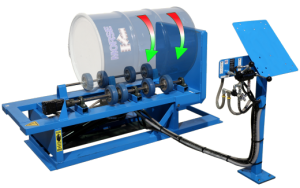 Drum handling equipment makes moving and pouring drums much easier. 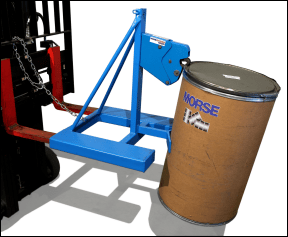 When workers don’t have to struggle through the handling of drums, it means they can do the job faster and get more done in the same amount of time. Increased productivity. When workers are able to handle drums easily, more work is completed at a faster rate. You can expect a significant increase in productivity, meaning your business can produce more and accomplish more during the workday. Monetary gains. Your business will be more profitable because of all of the above. Avoiding worker injury, greater efficiency, increased productivity —all of these allow you to save money and make more money for your business. 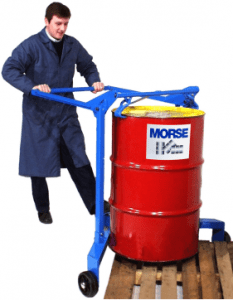 Drum transporters are made to aid in the ergonomic handling of all types of industrial pails and drums. Portable drum jacks are compact and ergonomic. The grapple system holds the drum into the steel saddle securely before lifting it up. The drum is held in an upright position during movement, which allows for the transport of open drums without worrying about spillage. Drum lifter/rotator/transporter is a three-in-one device. This equipment comes with a hand pump that can lift drums from ground level to a height of 68 inches. The hand gear maintains the controlled 360-degree rotation of the drum. It also comes equipped with a floor lock that will stabilize 55-gallon steel, plastic and fiber drums. Rotating drum carts can handle loads up to 1,000 pounds. The rotating drum trolley features two retractable handles for easy one-person operation. The steel handle is included to securely hold the drum during tipping, helping you to keep drum content mixed. Combination drum and hand trucks serve a dual purpose. 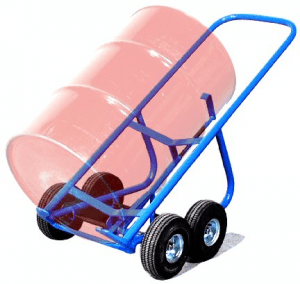 The curved frame accommodates 5 gallon pails and kegs and can handle loads up to 800 pounds. If you are constantly moving drums and other equipment by hand, this equipment will save a lot of time and energy. Drum clutchers latch around the drum and are used with cranes or fork lifts. The safety latch secures the drum when it is in motion. The clutcher is made of heavy steel to allow for a durable transport. 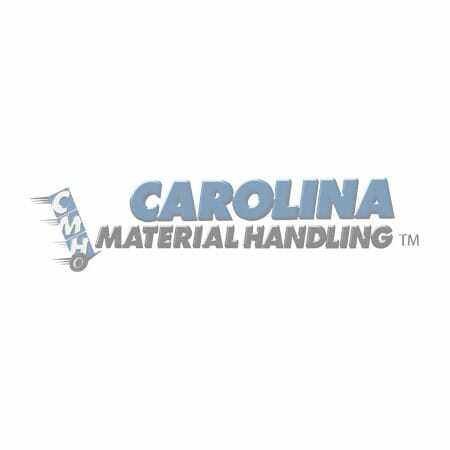 Contact Carolina Material Handling at (800) 822-8833 to learn more about the types of drum handling equipment that can help your business run more effectively. Knowledgeable sales associates will help you find the best equipment for your business. Use the below-the-hook barrel lifter to transport drums in an upright position. Drums are supported on a bar under the drum and secured with a positive grip cinch chain and ratchet mechanism around the drum. This lifter attaches to your monorail, crane, or chain block. You can also attach the barrel lift to your forklift using a fork hook. Where this Drum Lifter is Used? Requires 25″ between forks, as fork pocket openings are 25″ (63.5 cm) apart. Each opening is 2.5″ (6.35 cm) high by 6.5″ (16.5 cm) wide. Drum Truck Stands Alone on 4 Wheels Holding the Drum’s Full Weight. Does NOT Require that you Support or Balance Drum. Agitate the drum’s contents without opening the drum! Incorporate important stratified ingredients and eliminate sediment in the bottom of the drum. Mixing in closed drums eliminates the hazards, exposure, and cleanup associated with insertion mixers. 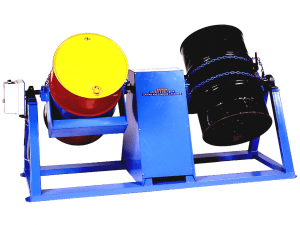 This compact, portable mixer and drum cradle roll closed drums to agitate the contents. You can also dispense directly from the drum via a faucet. The built in tipping bar provides leverage to aid loading and unloading. Sides and back are enclosed to protect the drive. Transport Drums and Move Rimmed Drums On and Off Pallets up to 19″ High. Lift and transport drums and barrels. Move drums on and off pallets, spill containment pallets in upright position, and drum dollies. Lift an upright drum 19″ (48.3 cm) high. The V-Shaped base of these drum movers allows you to raise and place a drum at the corner of pallets. The base of the drum mover will straddle a pallet up to 41″ (104 cm) wide and 7″ (18 cm) tall. These drum movers and palletizers / depalletizers have jaws to grip the top rim of upright drums, allowing you to efficiently lift a drum onto and off pallets and transport as needed. The completely mechanical, automatic grip has wide jaws and is built to last. Handle virtually any rimmed steel, fiber, or plastic drum. 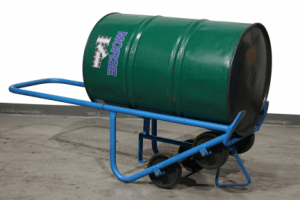 This innovative drum handler is designed to easily move rimmed 55-gallon (210 liter) drums on and off pallets up to 6″ high. This is an ergonomic, easy to use, and economical way to transport drums around your facility. The 4 wheels are mounted outside this drum truck’s frame to provide a wider, more stable base. The inflated tires help ease the truck over rough terrain. Ergonomic Drum Trucks to move and dispense heavy drums with ease. The innovative design of this 4-wheel drum truck provides extra safety, ease of use, and versatility. With this ergonomic drum truck, you can load and unload heavy drums with ease and move drums quickly and easily through narrow aisles while also keeping your hands protected inside the U-shaped Knuckle Saving Handle. Even pour a drum into a 5-gallon (20 liter) container. The four wheels fully support the drum’s weight and make maneuvering easy. It turns on a dime, and you don’t have to support or balance the load. With a drum truck, you engage the upper drum rim and and pull the handle to tilt the drum toward you. Then the two “toes” of the drum truck fit under the curvature of your drum to support it from underneath. No need to tip the drum away from you to slide a base plate underneath. You can then move a drum onto and off pallets, and position a drum for dispensing. When you’re done, the drum truck stands upright by itself for space saving storage. 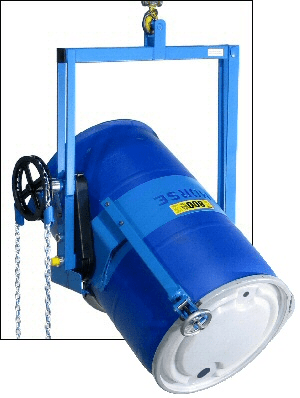 This below-hook drum carrier allows you to lift, move, and pour drums weighing up to 800 Lb. (363 kg), or half-full drums up to 500 Lb. (227 kg). 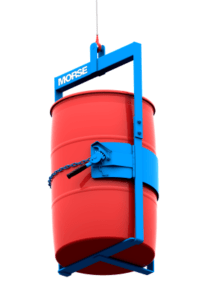 This model is equipped with the MORCINCH Drum Holder to handle 55-gallon steel drums with 22″ to 23.5″ (56 to 59.7 cm) outside diameter between the ribs. It also accepts MORCINCH Options to handle virtually any drum on the market. Forklift attachment with battery power tilt to move and pour drums. Converts your fork truck into a drum handler. Battery Power Tilt control decreases effort while increasing productivity. Also available with Wireless Tilt Control Option. This model forklift attachment provides 180 degree battery powered controlled tilt to fully invert drums in 15 seconds. The 10 foot (3 m) long pendant reaches to the forklift operator and has two push buttons to tilt drums forward and back. The tilt function is powered by a rechargeable 12V deep cycle battery. The battery and charger are provided with the forklift attachment. The drum holder has cinch chain and ratchet tightener to secure the drum in the holder. 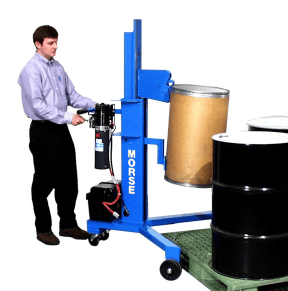 The MORSPEED 1000TM forklift drum grabbers / movers are a safety conscious way to handle drums. The MORSPEED 1000TM forklift attachment allows you to grab, lift, move, and place drums in minimum time without leaving fork truck. Raise and lower forks to grab and release the drum. The steel jaws are contoured to securely grasp a drum’s upper rim. They are completely mechanical and automatic. They grip on the way up by engaging the lower jaw under the drum rim and continuing to lift. They release when weight is taken off the jaws by setting the drum on the floor, pallet, etc. The forklift operator just raises and lowers the forks and drives forward and back as necessary. 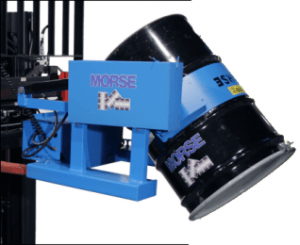 MORSPEED 1000TM drum handlers work with straight walled drums or even deformed ribs, since they do not depend on the drum ribs or friction. They do not require any modification to your truck. Requires 16.5″ (41.9 cm) between forks, as fork pocket openings are 16.5″ apart. Each fork pocket opening is 2.5″ high by 6.5″ wide (16.5 x 6.35 cm). 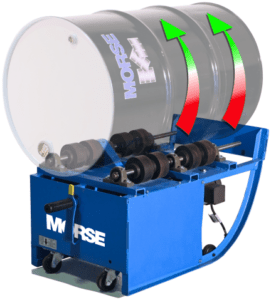 Our Morse Hydra-Lift Drum Rotators lift and roll your closed drums to mix and blend contents. 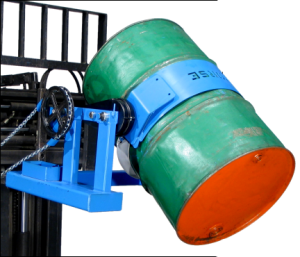 The built-in hydraulic system lifts drums from floor level and place tnem quickly and easily for rotation on the drum turner. 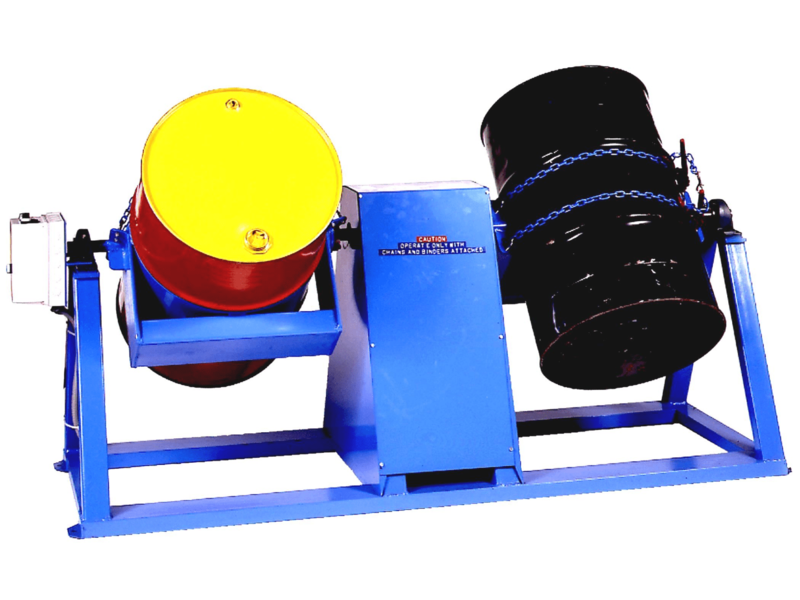 The are developed to provide “hands-off” drum handling and mixing. These drum rotators will help you save time, money, and labor with easy, ergonomic loading and unloading and by eliminating many of the hazards of manual drum handling. 400 Lb. (182 kg) Dry load. A shifting dry load exerts greater stress on the drum rotator than the fluid motion of a liquid load. The Handles are just for placing the lifter onto the drum. One drum lifter to do it all! Model 92 has self-adjusting tong-like action when you raise the hook, to lift a rimmed steel, plastic or fiber / cardboard drum. Manually center drum lifter on top of your drum and adjust it to drum width. It then grips various common types of closed head drums. Lift a drum from four-drum pallets or rows of adjacent drums. Capacity: 1,000 Lb. (454 kg). Weight of drum contents must not exceed drum manufacturer’s packing limit.